The House of Commons in London played host to a meeting to discuss the future of democracy 5 years on from the 2011 petition for democracy in the UAE on 22 March 2016. Anas Altikriti, Rori Donaghy, Courtney Freer and Ahmed Al Nuaimi addressed the meeting with their analysis of the events leading up to the petition and the consequences that activists in the UAE have faced and the broader impact on the region. In his summary, Ahmed Al Nuaimi, a political activist now in exile told the meeting that this activists had hope that “voices will not be killed … democracy will come”. In 2011 activists in the UAE presented a petition to the ruling authorities calling for elections, legislative powers to the Federal National Council and an independent judiciary. The petition was met with considerable hostility by the authorities and led to intense crackdowns. Activists were then rounded up and detained, following the enforced disappearances – mass trials began. The UAE 94 mass trial in 2013 was widely condemned – the UN declared it to be an unfair trial and called for the release of political prisoners. Despite this, the detainees faced sentences of up to 10 years. Those in exile were sentenced to 15 years. The crackdown on activists has become increasingly aggressive and in the most recent weeks 10 relatives of UAE 94 detainees had their citizenship revoked leaving them stateless. Dr Courtney Freer, research officer at the LSE Kuwait programme, has studied the history of Al Islah in the UAE. Al Islah, the main opposition group have perhaps suffered the most from the crackdown following the petition. Scores of members have been arrested and detained and in 2014 the group were officially banned in the UAE. Although Al Islah were initially established with the approval of the ruling family, in recent years they have fallen out of favour with the authorities. Dr Freer explained that as the group gained increasing levels of support across the Gulf state, the authorities grew increasingly weary of the group. She explained, that the regimes policies since 2011 have been working towards an overall ban of the group. Rori Donaghy, news editor at the Middle East Eye and former director of the Emirates Centre for Human Rights, spoke of his intimate knowledge and experience of the UAE 94 trial that followed the petition, which he covered during his time at the ECHR. He likened the UAE’s response to the petition as to one of a police state, noting the development of a private army of mercenaries "to put down civil unrest". Donaghy said that the UAE’s oppressive nature was as part of their response to the Arab Spring and warned that in the current climate, democracy in the UAE was “highly unlikely”. Rori Donaghy described the UAE as a surveillance state but also drew out the contradiction of the little opposition to the UAE’s policies from its Western allies given their perception of it as a tolerant country. 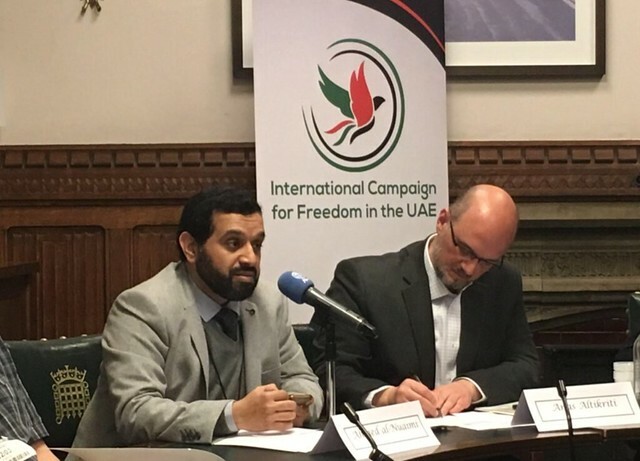 Ahmed Al Nuaimi, now in exile, having been sentenced in absentia to 15 years for having supported the 2011 petition was able to draw upon his personal experience and demonstrate the very real effect of the lack of democratic progress in the UAE. His brother, who had signed the petition in 2011, was so badly beaten and tortured whilst in detention that he was unrecognisable when his family eventually saw him a year later. Al Nuaimi’s nephew was arrested and detained for tweeting, in atmosphere of creeping control freedom of expression is not a liberty that anyone in the Emirates can enjoy. Although these were just a few personal examples that Al Nuaimi shared, he explained that there were activists in the UAE who had been forced to pay huge personal costs in their fight for freedom and democracy, but despite the cost he repeated that the struggle would continue in their pursuit of democracy. He concluded that their aim was to allow citizens to be able to live freely and to allow them to enjoy freedom of association and freedom of expression. Anas Altikriti, CEO and founder of the Cordoba Foundation, addressing the meeting in the mother of all democracy’s, asked if the UK was really serious about supporting democratic progress in the Middle East and drew upon the UK’s failure to condemn the UAE’s actions and the close relationship that the two countries enjoy. Describing the 2011 petition as “lenient” he said the crackdown against reformists in UAE was not acceptable and that the UK “owed them an explanation”. On the calls for democracy, Altikriti said “we need to demand it from everyone and expect it from everyone.” He described the practices of UAE state security as “inhumane and disgusting”. Concluding the meeting, Ahmed Al Nuaimi said that “we are proud of our government in its economic development but politically we are not being given a fair role to play”. The 2011 petition has had far reaching consequences, not just for activists in the UAE, but indeed across the region. In the five years since the petition, the autocratic regime has exercised increasingly intolerant policies of control – torture, enforced disappearances, lack of free expression and many more violations have become regular features in many lives in the UAE. Yet despite the difficulties, activists such as Al Nuaimi pledge to continue their battle for democracy and will not rest until change comes.